Hindus across the country and abroad have kick-started celebrations of Chaitra Navratras 2019. Festival of Navratri is full of joy and festivity. Hindus celebrate it with devotion all across the country. The nine-day festival is traditionally associated with Goddess Durga and worshipping her nine incarnations, reports The Statesman. It is during Navratras that many people hold fast for all eight days and break their fasting on the ninth day that is “Navmi” after offering the Goddess a special Prasad. Few fast only on the first and the last day and some just abstain themselves from consuming alcohol, onion, garlic and non-vegetarian food. A set of food items is strictly prohibited for the people who are fasting during this festivity. They are restricted to consume wheat and some other grains, few vegetables and spices, table salt and many other food items. Abstinence facilitates the spiritual purification leading to stronger will power.So it’s time to give up on regular food and switch to ‘Saatvik’ food items as a way to practice abstinence and get closer to the almighty. Besides the religious aspect, there is also a scientific reason for keeping these fasts. Chaitra Navratri falls around the month of March-April. During this period of seasonal change, our immunity tends to decline and therefore it helps to switch to light Saatvik food that doesn’t burden your digestive system. Kuttu ka atta (Buckwheat flour): Kuttu ka atta is quite filling, healthy and gluten-free. It is a good source of protein, iron and zinc. It is not related to wheat or any cereal grain, it’s more like millets and used in making a lot of fasting dishes like kuttu ka paratha, roti, cheela, puri and pakoda. It is a staple food during fasting days. As this flour is known to generate heat in the body, so it can be best savoured with chilled curd and green chutney. Singhara atta (Water chestnut flour): Singhara atta is rich in carbohydrate, fiber, vitamins and minerals. It has enough amounts of potassium, which helps to counter the effects of sodium and is good for lowering blood pressure. It can be used to make cheelas, poories and chapatis on fasting days when cereals are shunned. It can be used to batter-fry paneer and vegetables like potatoes. This flour makes an excellent gluten-free option as well. Rajgira atta (Amaranth flour): This flour is a powerhouse of nutrients. It is also full of antioxidants, vitamin C, vitamin E, iron, magnesium, phosphorus and potassium. All these nutrients are necessary for overall health. If you are looking for a filling and energetic Navrartri fasting meal, try rajgira paratha, poori, dosa or pakoda. Savour these with fresh curd, dahi wale aaloo and green chutney. Apart from these rajgira breads, you can make rajgira kheer as well. The flour is gluten-free and the parathas made out of this dough stay soft even after cooking. Sabudana (Tapioca pearls): Since sabudana or sago is an ingredient that is a part of fasting food, we can make a lot of snacks with it like sabudana khichdi, vada, tikki and kheer. Just remember to soak and cook it very well. Once cooked, they should not give you any resistance when you bite into these pearls. Sabudana is loaded with calcium, iron, potassium and vitamin K.Samak rice (Barnyard millets): These are ancient millets which are very healthy. They can easily substitute rice or semolina in any dish. 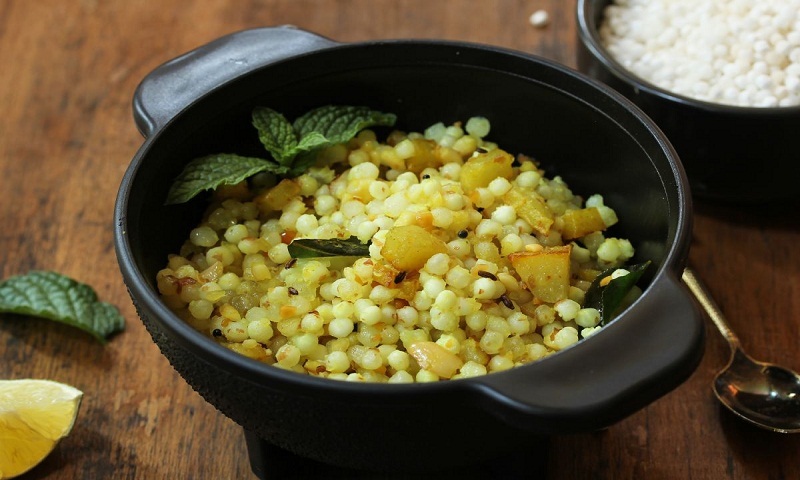 You can make Samak pulao, pudding, upma, idli, dosa and khichdi with these millets. Do give this nutritious rice a try. It is loaded with antioxidants, fiber and protein. It is easy to digest and takes very less time to cook. Being gluten-free it is also diabetic friendly. All these foods are easy on the digestive system and low on fats and high on proteins. They should be made with minimal spice, oil and flavourings. Only then you can fully reap their health benefits. According to Hindu belief, one should eat Saatvik food during these nine days. Saatvik food means the food that is pure, natural, vital, energetic and clean. All these food ingredients go with the Saatvik style of eating. The Navratra thali actually covers every nutritional category you can think of. All these food ingredients support the idea of a healthy lifestyle and if followed properly, it’s a good detox programme. Adopting these Saatvik ingredients in your daily life in Navratri even if you are not fasting can work wonders for your health.